Milind Pansare is Strategic Marketing Director at Aerohive, responsible for working with Aerohive’s strategic alliance initiatives, corporate messaging and positioning, and working with key industry analysts. 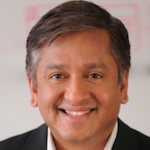 Prior to Aerohive Milind has led Product Marketing at several Silicon valley cloud startups, and held marketing and engineering leadership positions at companies such as Sun Microsystems (now Oracle), Saba Software, and HP. Milind holds a Bachelor of Science degree in Computer Science. Technology today can help contain Internet-connected things on your LAN. It’s therefore our individual responsibility to learn, adopt, and prevent attacks. SD-LAN builds on SDN in data centers and SD-WANs to create a new way to build adaptable, flexible, and cost-effective wireless and wired access networks. What if you want to mix APs from one vendor, switches from another, and manage it all from one console? Read how Aerohive and Dell are making this happen.